Here's a turtle balloon that you can make that's complete with its shell. Before you attempt to twist a turtle balloon animal, we strongly suggest that you master basic balloons such as the dog balloon animal. 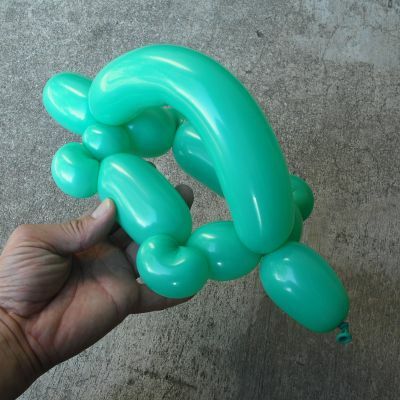 The turtle balloon animal is a relatively advanced balloon animal, and you’ll have to experiment to get the proportions right as the sculpture is rather unforgiving when you don’t estimate the lengths correctly. You'll need to know the basic twist and the pinch twist at the bare minimum. Since you're making the turtle out of a single balloon and there's little room for error, this one will take some practice and experimentation to get right. The instructions provided here are only estimations, and your ability to make the turtle come out right will depend on how firm you inflate the balloon, the manner in which you twist balloons and more. Be prepared to practice making this one and memorizing your uninflated end and proportions. This balloon animal not only works as a sculpture that you make and give away, but you can also make these as decorations, for example, if you have an event with an ocean or tropical theme. If you like turtles, check out our turtle balloon bracelet. One 260 Balloon. You're free to make the turtle out of any color that you wish. Inflate the balloon leaving at least a six-inch tip. Again, you'll have to experiment with the amount of uninflated end as this balloon sculpture is particularly unforgiving. It's a rare event to get this balloon right on the first try. Make a basic balloon twist about two inches in length followed by a second basic balloon twist about an inch long. These segments will form the turtle’s head and right shoulder. Make a pinch twist. This forms the first leg. Make a basic balloon twist about three inches in length followed by a pinch twist. This forms the side of the turtle and the right back leg. Make a basic balloon twist about two inches in length followed by a pinch twist. This forms the back of the turtle and the left back leg. Note that you will later insert a "tail" to this section of the turtle animal and it helps to make this a "soft" twist. This way, later, you can easily make a twist in the center of this section to accommodate and attach the turtle's "tail." Make a basic balloon twist about three inches in length (to match the other side) followed by a pinch twist. This forms the left side of the turtle and the left front leg. Make a basic balloon twist about an inch in length. Wrap the remaining balloon around the head of the turtle to complete the body—the legs and sides. The rest of the balloon will form the "shell" and tail. Using the remaining balloon, arch the balloon over the turtle’s body to create the "shell." Twist a basic balloon twist about an inch in length into the center of the turtle's back area. You have twisted a turtle balloon animal. If the proportions didn't come out right, evaluate what you've done wrong and adjust the next time accordingly. Again, if you like turtles, check out our turtle balloon bracelet.